Unlike ethereal investment vehicles such as Bitcoin, equities represent ownership claims on businesses that generate cash flows and can be accurately valued in a variety of ways. We have fundamental metrics, such as revenue, earnings and dividends. We can measure against horizons, both past and forward looking. And we can employ numerous adjustments that eliminate anomalies to produce more meaningful data. But what part should valuation play in asset allocation decisions for the long-term investor? Before we offer an answer to this conundrum, let’s get back to basics. There is now a nearly universal consensus on Wall Street and within the financial media that equities are expensive, or very expensive, and a market correction is inevitable. The pundits all use some variation of the same simplistic analysis to reach this conclusion. And it is true that relative to any single metric—whether it be trailing earnings, forward earnings or the Shiller cyclically-adjusted P/E ratio—most measures of equity valuations today are higher than their historical averages. But this is a one-factor analysis in a two-factor equation. There is a crucial variable missing: interest rates. Finance 101 taught us that equity prices are determined by the present value of future dividends. And capital always has a choice among different asset classes. Valuations, therefore, are dependent on interest rates. All else being equal, higher interest rates mean lower valuations and vice versa. On Feb. 2, 2018, the S&P 500 closed at 2,762.13. Based on this estimate, the forward 12-month P/E ratio for the S&P 500 is 18.0x, above the 25-year average of 16.0x. 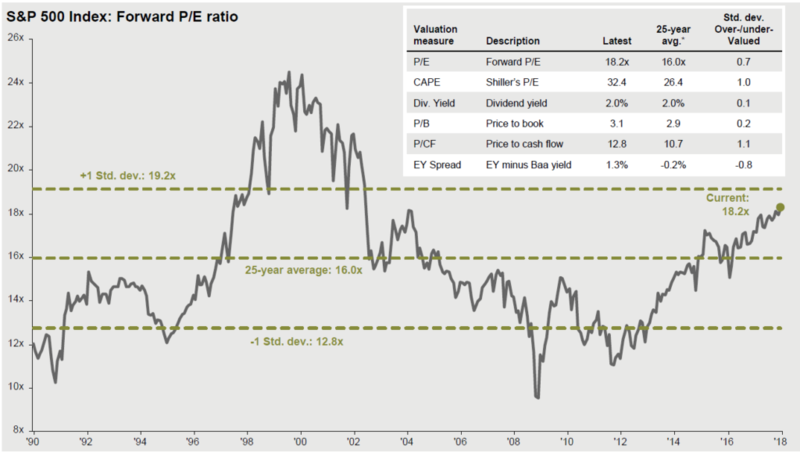 The chart from J.P. Morgan below helps contextualize and visualize valuation. On Dec. 31, 2017, the forward P/E ratio was 0.7 standard deviation above the 25-year average. Based on these facts, we conclude that with the interest rates used for discounting dividends recently higher but still closer to half their 25-year average, the roughly 2 percentage point premium between today’s forward earnings multiple and the 25-year average is perfectly reasonable. With projected forward earnings of $154, the earnings yield (or inverse of the P/E multiple) of the S&P 500 is about 5.6%—not quite double the current 10-year rate of 2.85%. To complete the return picture for equities, add in the dividend yield of 1.8%, for a total of 7.4%. With the Fed’s target inflation rate of 2%, the inflation-adjusted or real yield comparison is 5.4% for equities versus 0.9% for Treasurys. In this context, the hysteria about valuations is unwarranted. Certainly, interest rates may continue to rise. In light of the recent cut in the corporate tax rate, among other factors, it’s also possible that earnings and estimates may continue to rise in 2018. Analysts sharply increased their earnings estimates in January. Contextualizing valuation always requires consideration of both variables. The average annual drawdown for equities is 14%. And there hasn’t been any 10% correction since February 2016—two full years ago. Based on historical frequency, we’re statistically overdue for a bear market— a stock market decline of at least 20%. Between 1947 and 2017, the S&P 500 had 11 such declines, about one every 6.4 years, with an average peak-to-trough decline of 34%. The last bear market for the S&P 500 was a 57% drop over the 17 months ending March 9, 2009. The average person will experience eight bear markets in a 40-year working career and six more in a 30-year retirement. This is what it means to be an equity investor. Shiller’s CAPE ratio was close to 30 at the start of 2017, and many stock market gurus proclaimed equities overvalued. And yet, the S&P 500 index returned 19.4% in 2017 (21.8% including dividends). According to recent data from Charles Schwab, since 1958 through the end of 2017, the correlation between trailing P/E ratios and the S&P 500 price performance one year later is a meaningless -0.24 (on a scale of -1.0 to 1.0, representing perfect negative to positive correlation, respectively). Statistical noise. No valuation metric can reliably forecast the future. No one can consistently time the market, because it requires two exquisitely-timed decisions: when to get out and when to get back in. Since valuation isn’t a tool for timing the market, long-term equity investors simply need to tune it out, stay the course, and remain fully invested in a broadly diversified portfolio of domestic and international equities. Declines are temporary—a blip in one’s investing career, but the uptrend in equity prices is permanent. Buy and hold. The earnings of the S&P 500 have risen steadily over time, compounding at about 7% since 1975. Dividends have been compounding at about 6% over the same time period. 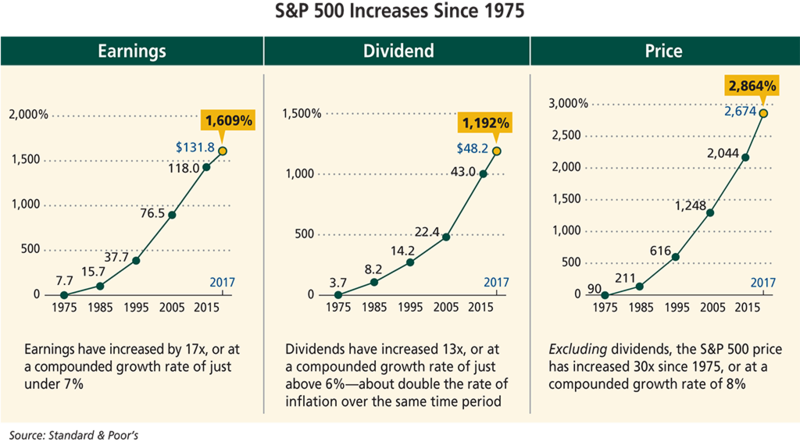 Thus, it should not be remarkable that growing earnings and dividends have manifested from time to time as new highs in companies’ stock prices—and the indices comprising those companies—compounding at 8%. Similarly, there is nothing to infer from a single stock market index reaching a new record high, in and of itself. Narrow framing involves making decisions without considering all the implications. In a financial context, it means evaluating too few factors regarding an investment. Regardless of the methodology used for valuing equities, there is always some measure or stream of cash flows—such as dividends or earnings—that must be discounted by some interest rate. In its simplest form, it’s a two-factor model. Valuing equities solely relative to a historical average crucially ignores the variable of interest rates. Such one-dimensional, narrowly framed thinking has caused many investors to make costly errors attempting to time the market.